It was blind luck that the steward had died instead of me. Marouk snapped his fingers, and a pair of liveried porters stepped into my cabin. They must have been waiting outside the door, I realized. The Chief Steward motioned them toward the body on the rug. The dead man’s face was grey and swollen, his lips inexplicably cracked. His gaze dropped to the doctor, still crouched beside the body, and then to Jax, who was sniffing the dead man’s fingertips. Garma’s already pale face blanched. 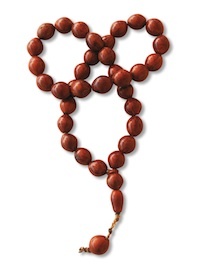 His fingers scrabbled for the bracelet of prayer beads tied around his wrist, twisting them violently and straining the cord on which they were strung. His lips moved, and I recognized the cadences of an invocation against evil. It was my turn to bristle. Saguins were not common, true, but neither were they soulless devils, no matter what the northern religion might teach. Marouk silenced the man with a look. “Bring him to the Medica.” The second porter shook out a sheet and wrapped the body with quick, practiced motions. Together they carried the dead man out. The doctor shrugged an apology and followed. “Please wait here,” Marouk said, “I will send tea.” He maneuvered his great girth through the door and left. “Superstitious cretins!” I hissed. My eyes flashed with heat. Jax leapt to my shoulder and rested his tiny palm against my cheek, cooling my temper instantaneously. It was a talent of his. “Trouble does come in threes,” Jax mused. Though he was poking fun, there was a serious note in his voice. “First the letter, then the poisoned rose. What next, do you think?” I shot him a warning glare, but it was too late. The Captain walked into the room. For the Scriptic prompt exchange this week, Andrea gave me this prompt: Pick a superstition and use it in a story or poem.. I gave kgwaite this prompt: You have (or your character has) five minutes to make an important decision. This is beautifully written as always. I wonder what the third trouble would be. Has it something to do with the captain? I love this story and your two main chapters. You always keep the suspense going too! I am hooked. Very good story. You just keep upping the ante. Love it. Lovely flow, tension and vivid imagery, as always. I really like the direction this story took this week. We’re glad to have you around. Another great segment of the story. Looking forward to finding out what the Captain has in store. Whoops! newcomer needs to go find the beginning and start over!